I think I say this every weekend, but I am SO happy the weekend is here! TGIF times a million! I have been a little tired this week. We are deserving of a good cocktail this Friday… Debbie and I have started a workout program and we both do our workout in the morning. I usually do mine around 6 before I go off to work, but this week it has been one of the hardest to get motivated in the morning. Were doing a Beachbody program. A combination of two awesome workouts. T25 and Piyo! Were on our first week of this program and so far we like it! Were also doing a 30 day ab challenge and taking our puppies for a short run every day as well. I like following a program. It gives me that extra motivation when I dont feel like exercising. Like this week! And I need to! Kevin and I booked a vacation! Were leaving Nov 25th for Curacao (tiny island in the Caribbean) for 10 days! I am soooooo excited. (Can you tell with all those !!!) It will be our first trip alone together and we are really looking forward to it. I cant wait to eat all that Caribbean food and sip on drinks in pineapples lol. Mark and Debbie are taking a trip around then as well to Hawaii. So needless to say, we both have about 5 weeks to get our asses in gear. We will keep you posted on our progress, if any lol. Anyways, back to the cocktail… My daughter has a friend named Carla and she is a total sweetheart. She also follows our blog so she knows we like a good cocktail. She and her mom were on Hornby Island (in BC) and she text me because they found an Elderflower liqueur that is made on the island and when they tried it and loved it. They were kind enough to bring me a bottle! Isnt that nice of them? The perks of having a blog with cocktails and friends that know lol! I had heard of Elderflower liqueur before. Its sold in the regular liquor stores as St. Germain’s, but ours is artisan made so it might be a tad bit different. Its made from Elderflower, which is a delicate little white flower that grows on hillsides. The flowers are pressed right when they are picked and made into this concoction that tastes just like fragrant flowers smell. Slightly sweet, slightly earthy, with a hint of citrus. 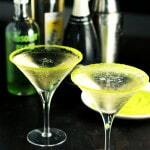 It goes well with white wine and champagne which is what we have paired it with in this Pear and Elderflower Bubbly Martini. 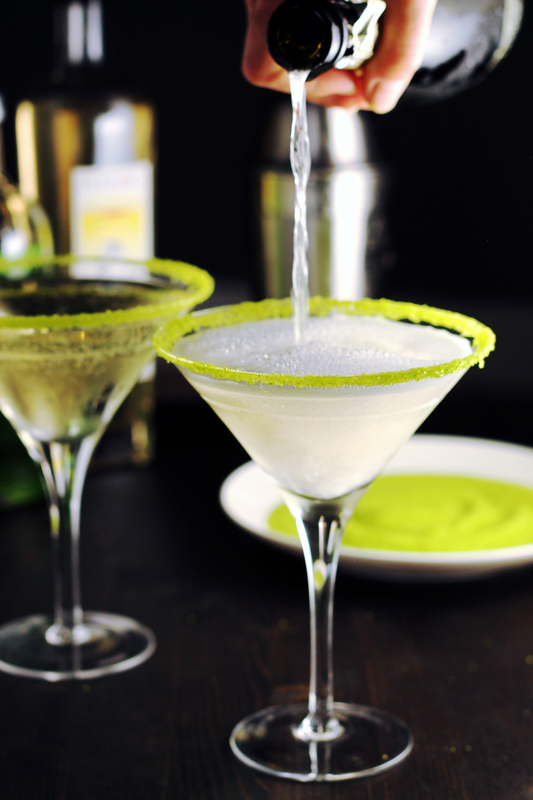 Debbie is not a huge fan of Pear, but she liked pear in this cocktail. 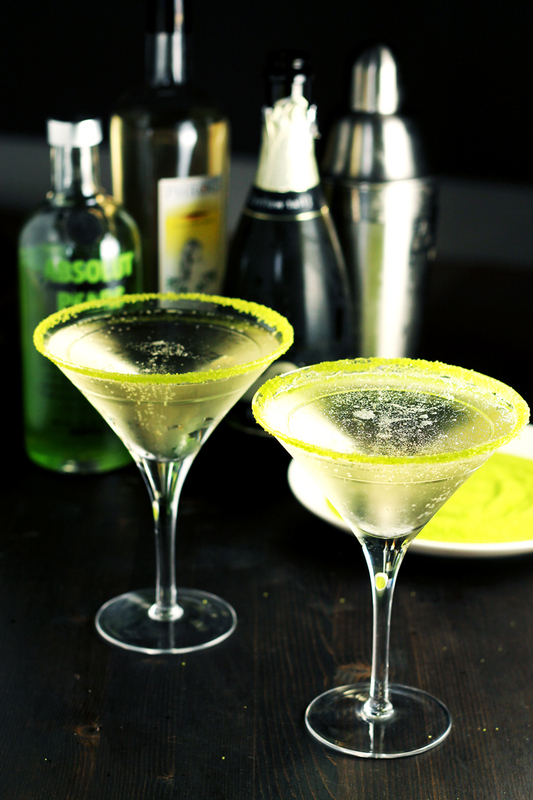 We mixed Pear Vodka with the Elderflower liqueur and then topped it off with sparkling wine. Be careful with this one! Its got a kick. 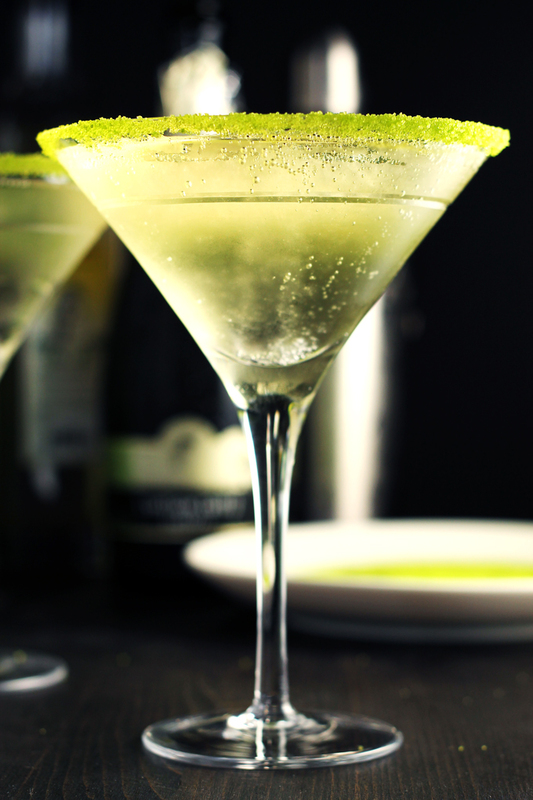 If you want it to be a little less strong, you could add half sparkling wine and half soda. You could also add a little bit of simple syrup if this drink isnt sweet enough for you. How good does this drink look?! 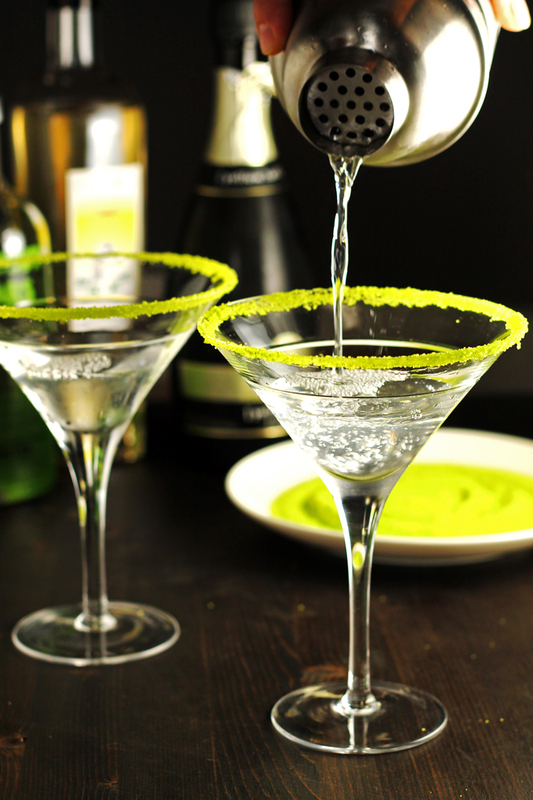 Rim your martini glass with sugar if you like by wetting the top edge and dipping it in the sugar rimer. Next add the pear vodka and the elderflower liqueur. 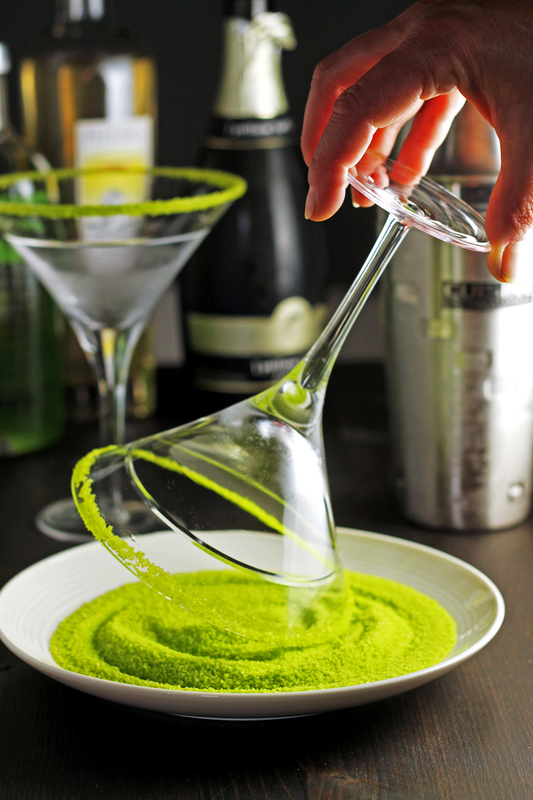 Follow with champagne or sparking wine to the top of the glass. If you decide to add some simple syrup you could add it before the bubbles or after. Its up to you. 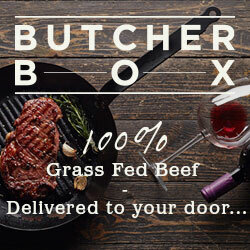 We would do it after just because then you can taste it first to see if you even want any! If you like add some ice cubes.